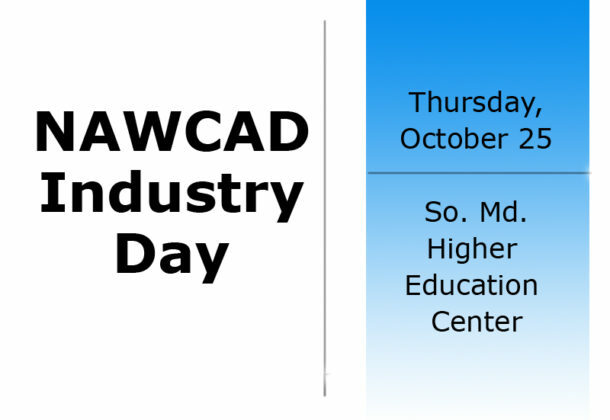 Government contractors in Southern Maryland can get great benefits from attending NAWCAD Industry Day from 8 am to noon Thursday, Oct. 25, 2018, at the Southern Maryland Higher Education Center, Building 2, Center Hall, located at 44219 Airport Road in California, Md. The event will be hosted by The Patuxent Partnership. Bonnie Green, executive director of The Patuxent Partnership, will give the welcome and introductions at 8 am, along with Jeff Guarnero, deputy department head of AIR 2.5, Contracts. The executive kick-off will begin at 8:10 am with the first speakers of the event, RDML John Lemmon, Commander of NAWCAD; and Leslie Taylor, Deputy Assistant CDR for Test and Evaluation and Executive Director of NAWCAD. Starting at 8:30 am, the topic for the event will be Capabilities Based Test & Evaluation (AIR 5.0), with speaker Ken Senechal, Director of Capabilities Based Test and Evaluation. At 9:30 am, participants will receive an OSBP update from John Murray, Deputy Director in the Office of Small Business Programs for NAVAIR. After a break from 9:45 to 10, participants will get an update on Current Acquisition Initiatives, Metrics, Contract Actions and Strategic Source Vehicles from Al “Bunky” Hensler, Deputy Division Head, AIR 2.5.1 Contracts; and Jeff Guarnero, Deputy Department Head AIR 2.5, Contracts. The event wrap-up and conclusion will begin at 11:30 am with a question-and-answer session, then closing remarks. Registration is free to all attendees of the Industry Day events. Acquisition workforce attendees can earn four CL points. Anyone who is interested in the Industry Day event is encouraged to take an online survey as soon as possible before the event. The Patuxent Partnership is helping NAWCAD plan the event and sponsoring the survey. By taking a few minutes to complete this survey, participants can help TPP better meet the needs of attendees through the day’s agenda.